Will the last one out please switch off the turntable? So, another high-profile retailer is in administration, possibly on its way out to pasture after all those years on the high street. HMV. And this time it’s one that formed an important part of my past. It takes me back to those days of unlimited spending. I was on an OK wage, living at home, and had disposal income. Couple that with some form of C of E guilt (I can’t claim the Catholic version), and you’ll understand I was buying at least three LPs at a time from HMV back then. Confused? Well, an album is hard to hide from your folks or work-mates, so it always made sense – to me, at least – to buy more than one at a time. That way at least you’d have something to feel guilty about. And with three LPs (or ideally just a 12″ single on either side of your album) you could at least pretend you’d spent a bit less. All part of denial as a vinyl junkie, of course. But at least I’m still here to tell the tale. In later days, secretive purchases of CDs proved comparatively easy to get away with. But with long-playing albums on glorious vinyl, you needed more than a big overcoat to avoid unwelcome questioning. “Spending money on records again? You could put a deposit on a house with all that cash you waste. You can’t possibly listen to them all.” That kind of thing. Hiding purchases from workmates was a bit different, and I quite enjoyed the attention really. “Oh no, what’s he got this time? Something by The Streaming Nosebleeds or The Vibrating Cockerels?” No. The actual band and album titles were far better than they could imagine. “Half Man Half Biscuit? What the hell’s that about?” “Close Lobsters? Are you deranged?” “The Wedding Present? Ooh! Have you set a date?” “Hothouse Flowers? They’ll never come to anything with a stupid name like that!” Oh really? “Anyway, what’s wrong with Billy Joel, or Tina Turner?” I’d finally snap of course. “Well, how long have you got? Only I want to get home and listen to The Men They Couldn’t Hang.” Great days. 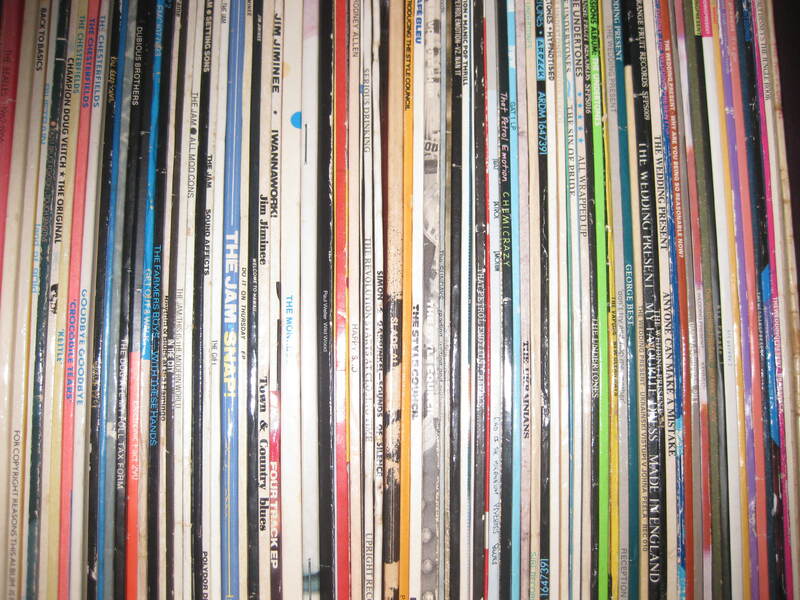 A lot of those LPs came from HMV in Guildford. Around that time I started frequenting a record shop by the bus station, run by my mate Ben, who catered for my 60s soul, 50s rock’n’roll and various other off-catalogue purchases. But there were also a lot of indie albums that came straight out of the rack at HMV. I toyed with Our Price for a while, but it was never a first choice. I can’t ever recall anything other than a quick thumb-through at a Virgin Megastore or Tower Records during trips up to London. Too many people, and always the reality of forgetting what was actually on my list when I finally found enough space to browse. Woolworth’s was another favourite, no holidaying in Cornwall, Devon or Wales complete without a go at the pick’n’mix and a cut-price record. The same went for occasional visits to the main drag in my adopted Lancashire or back in Surrey. I remember being in Woolies in Fishergate, Preston, a few days before it closed. Mayhem. I think I got a Rick Rubin-produced Neil Diamond CD and the Robert Plant/Alison Krauss collaboration. Both great albums, but I also remember the scrum and indecency of my fellow shoppers. The staff looked a little bemused and hurt, and it just seemed wrong to be part of that whole riot. Never again. I have to say there were lots of mail order purchases too. Get that, kids. Not internet purchases, but actual mail order. 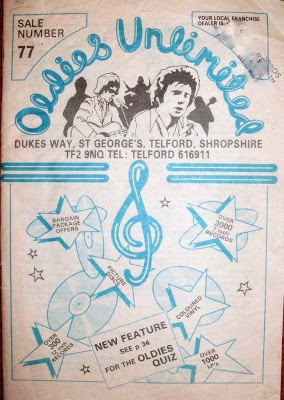 Oldies Unlimited was brilliant for all those superb ’60s and ’70s singles, even a few ’80s ones by acts I had no real desire to buy albums by – not so much one-hit wonders as soon-forgotten often kitsch classics. By the time I took The Fall’s advice and Hit the North, it was Action Records in Preston for me, and breaks in North Wales wouldn’t be right without visits to Cob Records in Porthmadog. 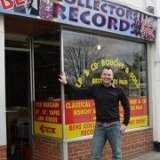 Meanwhile, my mate had his own shop in Guildford by then, and Ben’s Collectors Records remains my first port of call, despite a 480-mile round trip these days. The same goes for any independent record shop with affordable prices. Long may they survive – whatever the economic climate. It was a long time before I even switched to CDs, let alone turned to internet buying. And I think I’ve only paid for about four downloads over the years, normally obscure singles that don’t appear on anything else. I’ve borrowed a few albums from local libraries, but it took me a while to get into Amazon and eBay. Now, heavily-diluted spending power means I’m mostly a bargain hunter at charity shops, prepared to sift through all the Daniel O’Donnell discs to find the odd unexpected nugget. I actually went for a job at HMV while still a student. It seemed like the perfect job for me at the time. Lots of surly blokes with not much to say (I could do that), and now and again a gorgeous girl behind the counter with a nose ring and a lovely smile. In later days, it was more likely the surly blokes had the piercings, and probably everywhere but their nose. But it was different in the ’80s. I seem to recall that in the interview they saw right through me. However hard I tried to convince them I was trainee management material, they knew full well I just wanted the staff discount and had no ambition to get into ‘retail’ or run their shops. My other main HMV anecdote involves a signed copy of Back to Basics by Billy Bragg, after a meeting with the so-called big-nosed bard of Barking in HMV Guildford in March 1985, ahead of an appearance at Guildford Civic Hall that evening and Top of the Pops two days later performing Between the Wars. The anoraks among you will be thinking that doesn’t quite add up. But bear with me. 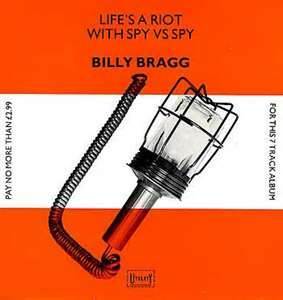 I’d been a Bragg fan since his first John Peel session in the summer of 1983 , and two years later handed over my vinyl – first LP Life’s A Riot with Spy vs Spy and follow-up Brewing up With Billy Bragg. Probably his new hit EP too. He signed it there and then, but I later decided to offload those and downsize for a signed copy of Back to Basics, a 1987 vinyl compilation featuring all 21 of those recordings. Probably not my most astute financial move. Anyway, I remember being in a very long queue at HMV in Swan Lane, Guildford – on the site of the former Doll’s Hospital where I once bought plastic soldiers for in-house Second World War re-enactments. When I finally got to the front (having rehearsed my words several times) I blurted out, “So what’s it like to have a chart-bound sound, Billy?” It was supposed to be funny. Ironic, really. And it didn’t need an answer. Having read all his interviews, I expected a clever one-liner about how he’d changed his views and was now going to swap his modest approach to rock’n’roll for stretch limos while drinking champagne out of groupies’ smalls. But maybe I was a bit too earnest in my delivery, because he took a good look at this skinny 17-year-old (with the sort of personal eye contact you wouldn’t expect from Bono) and told me what he thought I wanted to hear. “To be honest, it’s not really any different. I’m still doing what I want to do, whatever number I’m at in the charts.” Something like that, anyway. I didn’t know where to go from there, so probably just went red, smiled and turned on my heels with nothing more than a mumbled, ‘Thanks, Bill’. A brief conversation with Ben (pictured, left) today revealed a visit by Paul Young to that same HMV store when No Parlez came out too. I won’t really be mourning HMV, because I’ve outgrown them, as they in turn outgrew me. I will no doubt be looking to see what turns up on the internet if they go under, but really don’t want to be some kind of reaper when there’s all those lost jobs involved. I was never comfortable in camera or gadget outlets, as there’d always be some spotty oik or slimy salesman trying to sell me a warranty I didn’t need or upgrade to the next model, so I won’t miss Comet or Jessops. But HMV was part of my life once – or at least part of my working lunch hour. So I’ll at least raise a glass here to all those who have served the firm’s major high street stores over the years, not least knowing from my own spell in Boot’s, Guildford, just what stuck-up arses there are out there demanding service from under-paid shopworkers. And maybe I’ll play A New England or Strange Things Happen to mark the occasion. This entry was posted in Music and tagged Billy Bragg, Comet, guildford, Half Man half Biscuit, HMV, Jessops, Porthmadog, Preston, The Men They Couldn't Hang, The Wedding Present, Woolworth's. Bookmark the permalink. 6 Responses to Will the last one out please switch off the turntable? Thanks for that Malcolm; great stuff. Seems we share quite a few memories. I’d forgotten all about Oldies Unlimited! Their ad was always in the back of Melody Maker as I recall. ps. I met my missus at a Hothouse Flowers gig. Cheers Pete. Come to think of it, I still have a couple of singles boxes tucked away from Oldies. And yours was a Hothouse Flowers romance, eh? Just goes to show that good love never ever wilts! Great stuff, Simon. I’ll have to raid your place for a few signed items one day, by the sound of it. I’ll just follow the pink fuzzy cloud! I worked at Swan Lane between 1986 and 1988 and was mostly responsible for the burgeoning Indie singles and albums selection. It was easy, I just made sure we stocked what Peel was playing and they lapped it up – though I did once get caught out with under ordering on the debut Pixies LP. We also got away with playing the Justified Ancients of Mu Mu 1987 album instore at lunchtime from beginning to end, much to the disgust of those in the easy listening section. Fond memories. Thanks for your words, David. Daren’t ask if you fitted into my ‘surly’ profile, mind. Hopefully you were on commission from my purchases around that period though. Now that would have been a pension plan!